The Scottsdale Public Library has announced its next round of free salon series events celebrating the history of Scottsdale beginning in January. The first event on Thursday, January 10, 2019 will feature Golf in Scottsdale at Arabian Library at 6pm, just in time for the annual Phoenix Open golf tournament. Join us at Civic Center Library on Thursday, February 14, 2019 for History of Scottsdale Housing at 6pm. The March event will delve into How Scottsdale Evolved as a Health & Wellness Center. It will take place Thursday, March 14, 2019 at 6pm in Appaloosa Library, which will turn 10 years old in 2019. In April, we’ll explore Why Scottsdale Looks the Way It Does at Mustang Library Auditorium on Thursday, April 11, 2019 at 6pm. Lastly, on May 2, 2019 we hope to celebrate the opening of the Scottsdale Heritage Connection (SHC) with Preserving Scottsdale’s Stories: Publications and Oral Histories in the SHC Collection. This event will take place in Civic Center Library’s Copper Gallery at 6pm. All events are hosted by Scottsdale historians and authors Joan Fudala and Doug Sydnor. They will include photos, videos and other historic documents that will be featured in the SHC when it opens in 2019. 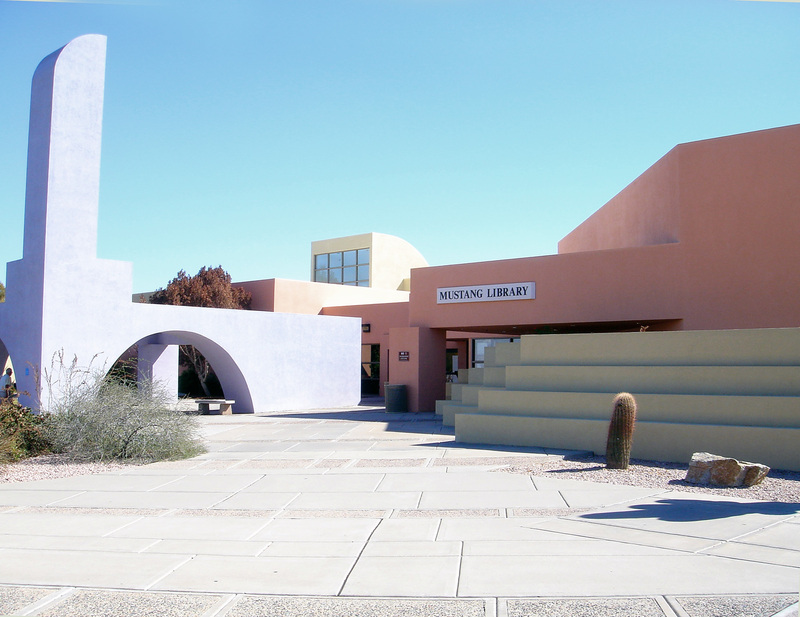 The SHC is being funded through a capital campaign by the Friends of the Scottsdale Public Library. For more information on the series or the City’s historical collection, please visit http://www.scottsdalelibrary.org/historical. This entry was posted in Events and tagged appaloosa, arabian, authors, civiccenter, heritageconnection, history, mustang on November 1, 2018 by Trey Granger. The Scottsdale Public Library will be continuing its salon series celebrating the history of Scottsdale in September with three free events. While the previous salon series showcased all its events at the Civic Center branch, this fall’s series will offer programming at three different Library branches. Just in time for the new school year, the event on Thursday, September 8 will feature A History of Scottsdale’s Schools at Mustang Library from 6pm to 7pm. Join us at Civic Center Library on Thursday, October 11 for Celebrate 68! 50th Anniversary of Scottsdale’s Civic Center from 6pm to 7pm. This will also include a salute to the Civic Center Architect, Bennie Gonzales. The last event will help prepare for Scottsdale’s winter visitors with Scottsdale’s Tourism & Resort History. It will take place Thursday, November 15 from 6pm to 7pm at Appaloosa Library, which will turn 10 years old in 2019. All events are hosted by Scottsdale historians and authors Joan Fudala and Doug Sydnor. They will include photos, videos and other historic documents that will be featured in the Scottsdale Heritage Connection (SHC). The SHC is a permanent exhibition opening set to open in 2019 to showcase all of the City of Scottsdale’s historical documents. It is being funded through a capital campaign by the Friends of the Scottsdale Public Library. This entry was posted in Events and tagged appaloosa, authors, civiccenter, heritageconnection, history, mustang on August 1, 2018 by Trey Granger. The Mustang Library branch officially turns 30 years old on June 13. While it may not have the visual recognition of the Arabian branch or the Old Town history of Civic Center, it’s the second oldest branch in Scottsdale and also the second biggest at over 31,000 square feet. It also provided new innovations to Library patrons like drive-up window service for check-outs and returns. If you haven’t been to Mustang in awhile, stop by to celebrate its 30 years as a mainstay in the Scottsdale community. This entry was posted in External News and tagged mustang on June 10, 2017 by Trey Granger. 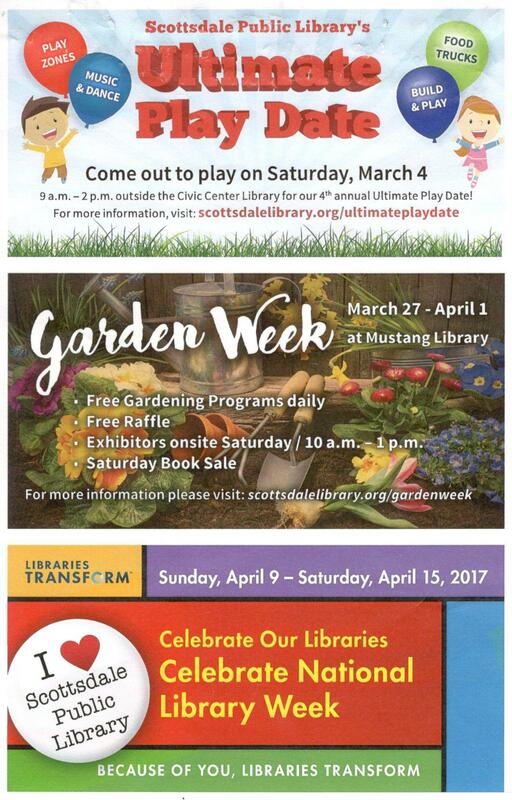 With winter visitors and beautiful weather already started, the Scottsdale Public Library has plenty of fun events on tap for spring 2017. On March 4, the Civic Center branch will feature the 4th Ultimate Play Date from 9am to 2pm. This event is catered to children ages 0-8, and will include Play Zones specializing in everything from music & dance to science & technology. There will also be a grilled cheese food truck. All activities are free of charge. From March 27 to April 1, Mustang Library will be hosting Garden Week. Every day will have free special events, including a flower show, presentations from the Butterfly Wonderland and the Maricopa Audubon Society and tips on landscaping, urban farming and Xeriscape. It will culminate on April 1 with a book sale. From April 9 to April 15, celebrate National Library Week. This annual national celebration has been promoting appreciation of our local libraries since 1958. The theme for 2017 will once again be “Libraries Transform,” and two-time World Cup champion Julie Foudy will serve as honorary chair. Lastly, be on the lookout for the first Books2Go installation at Chaparral Park in March. Shaped like a doghouse to match the dog park where it’s located, it will be a micro-library supporting the “take a book, leave a book” system. No library card is required to use this program. This entry was posted in Events and tagged books2go, civiccenter, gardenweek, libraryweek, mustang, ultimateplaydate on February 15, 2017 by Trey Granger.